Giving young children fun and easy crafts to do is essential in helping them gain confidence. Crafts are also a great way to help reinforce lessons. 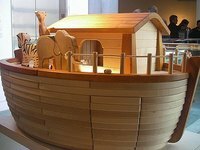 Try making this Noah's Ark model with your child or in Sunday School class. The materials listed above will make one Noah's Ark model. The model is best suited for children 6 to 11 years of age. Prepare your area by laying down newspaper. Place your materials on the newspaper. Begin by painting the 4-inch clay pot and the 6-inch clay pot base with brown acrylic paint. You do not need to paint the inside of the clay pot, but do paint the entire base. Let this dry. Once the clay pot has dried, paint windows around the clay pot, spacing them apart evenly. Use the black acrylic paint to make the windows. Keep in mind that the clay pot will go upside down into the clay pot stand when determining how to paint your windows. You will probably fit about three windows around the pot. When the clay pot windows are completely dry, you can then add the animals to the ark. Using foam animal stickers that are self-adhesive works great with young children. Let them stick on animals in the windows and around the base of the pot to decorate. Next, you will work on Noah himself. Paint the 2-inch clay pot with blue acrylic paint. You do not need to paint the inside of the pot, as it will be positioned upside down. Once the paint dries, glue the 1-1/2 inch wooden doll head to the bottom of the clay pot, which will actually be the top of Noah's body. Add facial features to the Noah using the black paint for eyes and a nose. Cut small strips of brown yarn to be Noah's beard. Glue the strips under Noah's nose. Finish Noah by fashioning a brown pipe cleaner into the shape of a shepherd's crook and glue to one side of Noah. Now your craft is complete! Go slow and have patience with young children. Have the shepherd's crook cut to an appropriate size before beginning the craft. To make animals in the windows look more realistic, cut the foam stickers to have just the animal's head sticking out of the window.